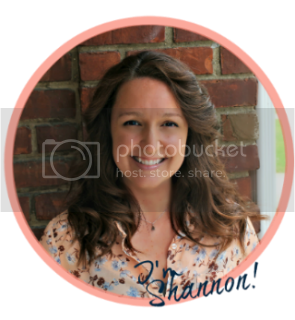 I wanted to focus today's post on my lovely, DIY Summer Patio. I am super proud of this project; I had the vision in my head back when there was still a ton of snow on the ground, and to see it work out pretty much exactly the way I wanted it to, is the bee's knees! Let's get right to it! 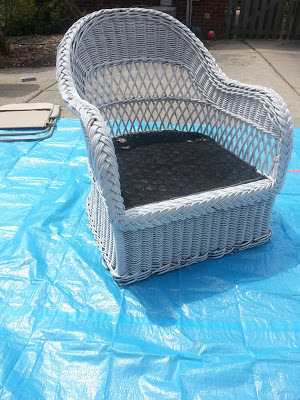 Repainting wicker is a relatively easy process. Unless you have a ton of time and mountains of patience, I suggest you always use spray paint for this process. 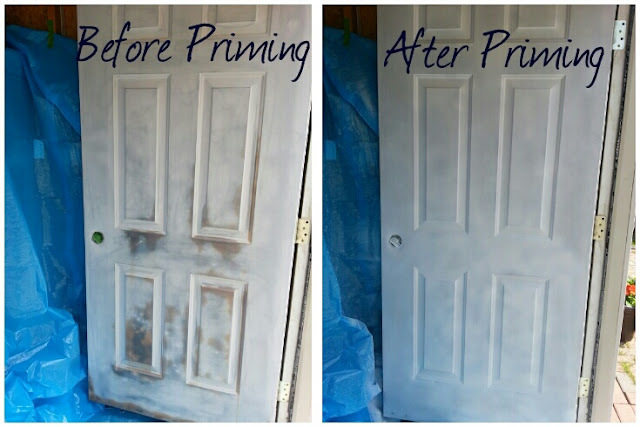 You want to make sure you use a great primer to begin, a great color and a FANTASTIC sealant at the end! 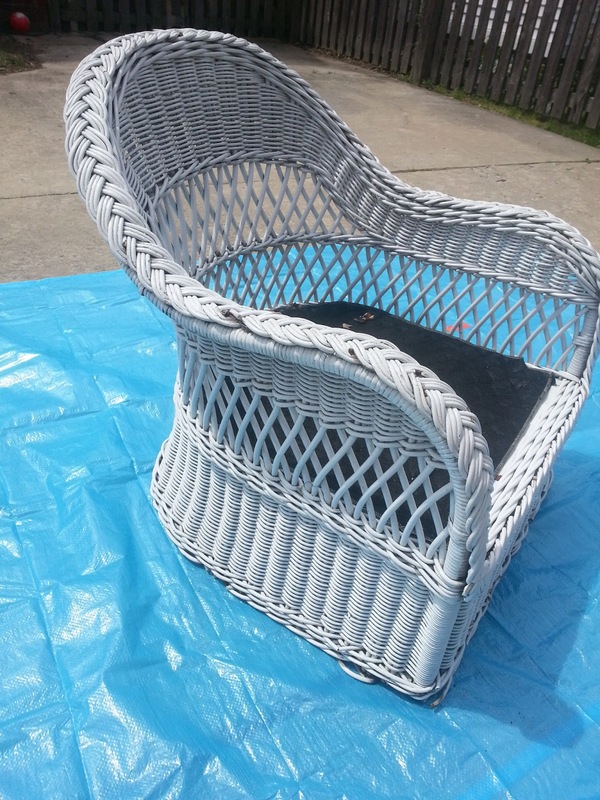 Simply clean your wicker with a slightly wet rag and then you're ready to spray a good, light coat of primer. 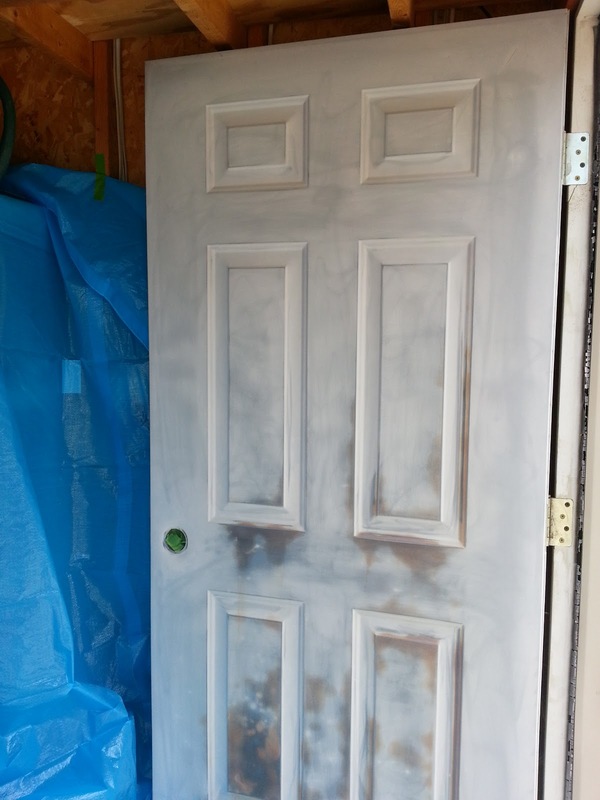 I chose a dark gray primer because we are going from light to dark here and a dark primer to start will give us less coats of our main color. Once the primer dried completely, start your color process. I wanted a rich color to make the furniture look brand-spanking new, so I chose an espresso color. This stuff is amazing. Looks like chocolate! 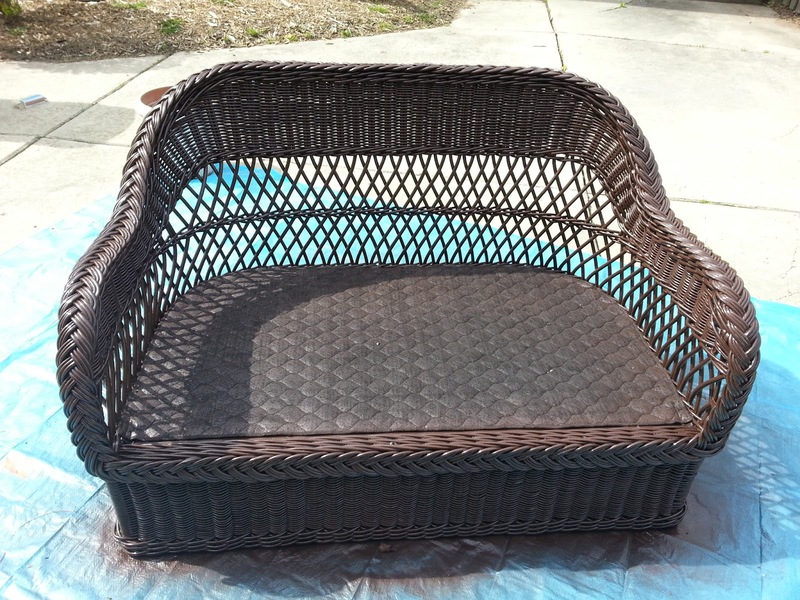 Each piece required two full coats of paint, along with various touch ups as it dried, to ensure that no white wicker was peeking through. Spray from all angles, and make sure you walk around your pieces looking at them from every point of view. Once all the paint had dried, I went over every piece with a clear gloss spray, to seal and protect the furniture from the elements. 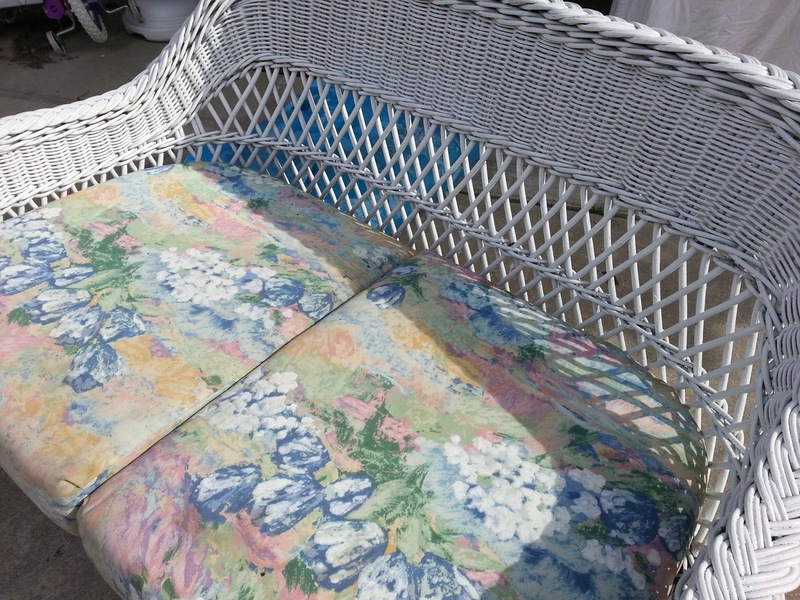 Once the furniture was painted, I was tasked with picking the perfect cushions. This was not easy. Cushions are expensive too! I debated using fabric spray paint and just painting the cushions myself, but after trying 3 colors of a popular fabric paint, I was completely disappointed and very unsatisfied with the results. 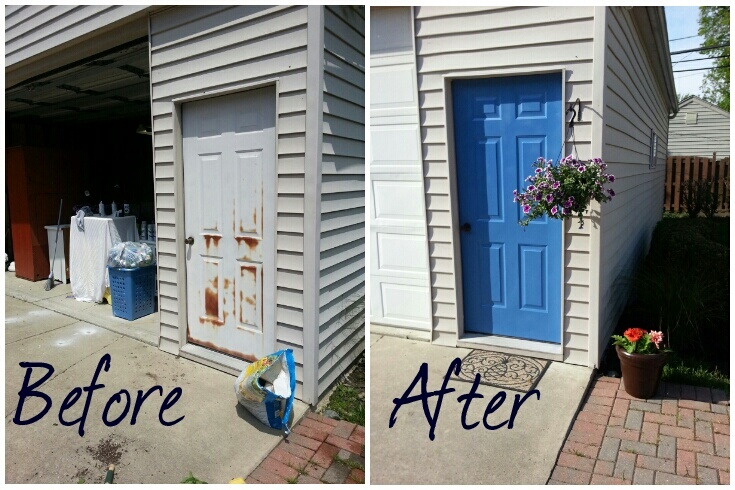 I ended up waiting for some cushions to go on sale at Pier 1 and was able to find comfy cushions in a pretty blue, to match my already painted garage door re-do project. 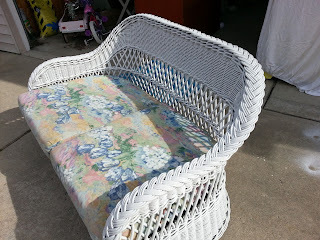 Because the cushions were still a little pricey, I only purchased 3, and that was enough for my love seat and chair. The sofa will have to wait until next summer. 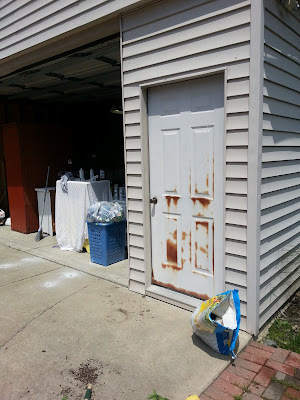 How many cans of paint you purchase for a project like this, is up to your discretion. Estimate your usage beforehand and that way, when you're at the store, you have a plan of action and won't spend a lot of time staring blankly at walls of product. 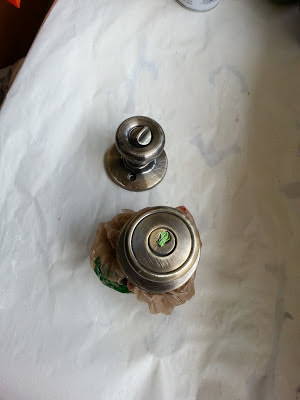 I purchased 8 cans for my furniture project, and ended up using about 2 cans per piece of furniture as well as the beginning of one more can for touch ups. Which left me one and a half cans to use for any outdoor accessories to coordinate with the look of my patio. This is why I don't mind over-purchasing spray paint. I ALWAYS will have a use for the leftover paint! I painted two planters I've had for years in the rich, espresso color and filled them with bunches of Happy Gerbera daisies, which I found on sale at Home Depot. I happened upon another planter in the back abyss that is my garage, and painted it with left over, blue spray paint from my garage door project. Into that pot went a gorgeous variety of succulents, also found on sale, this time at Lowe's. This photo was taken after the planters had been outside for about a month. I've had a hand-me-down patio table that has spent time on a balcony in Brazil, had another stint on a balcony at one of my first apartments and even more time on a balcony at my cute little flat where I lived up until last year. It has been painted twice and had shown it's many years of wear. The paint was chipping and faded. 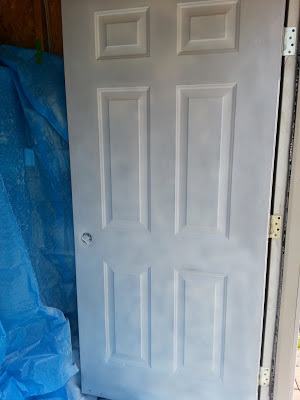 I decided to paint it in the pretty blue, to pull the color theme together, and this time, I made sure to sand it down with my electric sander and made sure to put a good primer coat down before painting. Again, once the piece was painted I went over it with a good coat of the clear, spray gloss. 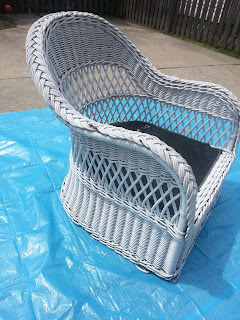 So far, it's held up against the rain, wind and harsh sunshine. This pretty, custom painted pot is courtesy of my lovely, little Livy who wanted to try her own paint project; just like Mommy! The finishing touches were an outdoor area rug, on sale at Lowe's for $17.00, and then, of course, the piece de resistance... our patio umbrella! 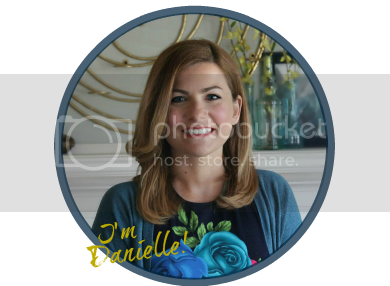 I spent a ton of time researching gazebos and after reading one too many customer reviews about how these types of decor items do not stand up well to windy weather, I decided to check out umbrellas. I was able to snag one on sale at Kmart and with Boyfriend's help, we had it set up within a day! I hung a wind chime from the umbrella arm and it gets just the right amount of breezy day wind to give us some calming background music when we're in the backyard. I also found a used lawn ornament, that was a slimy green color and sprayed it in the pretty blue color I had on hand, and it now sits in my slowly-but-surely-growing garden right off my back door. Its a peacock and I love it! The first task was smoothing over that rust and decay. I have an electric, hand held sander, which I love. I had never worked with rust like this before, so I wanted to make sure I started things off right. 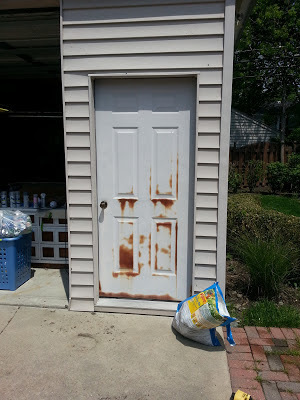 I headed up to my local hardware and discussed, in depth, what type of sanding grit to use on this type of door. 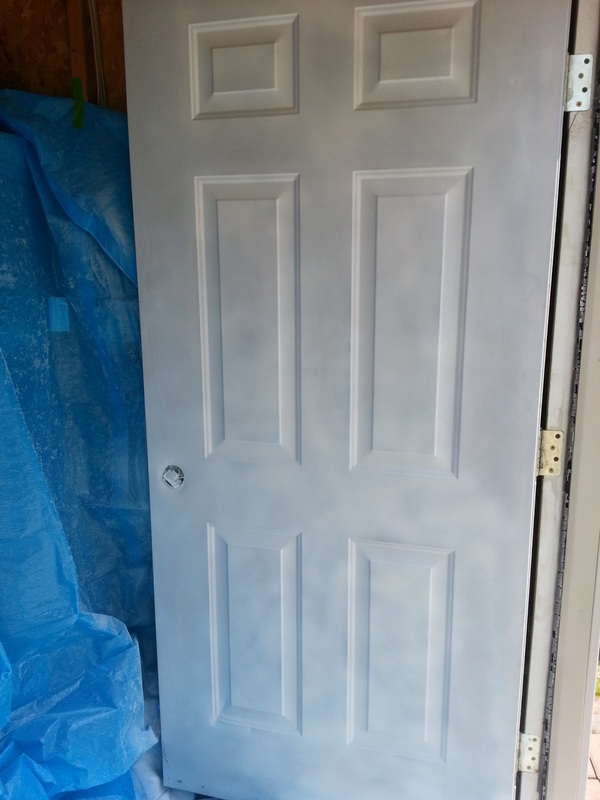 The only information I had to come ready to the conversation with were what type of door I was working with (metal) and what type of sander I had at home, and the technician knew exactly what I would need. He recommended a super rough grit to begin and a finer grit to smooth the surface after the rust had been removed. He also stressed priming the surface before painting, to prevent future rust. Easy enough. 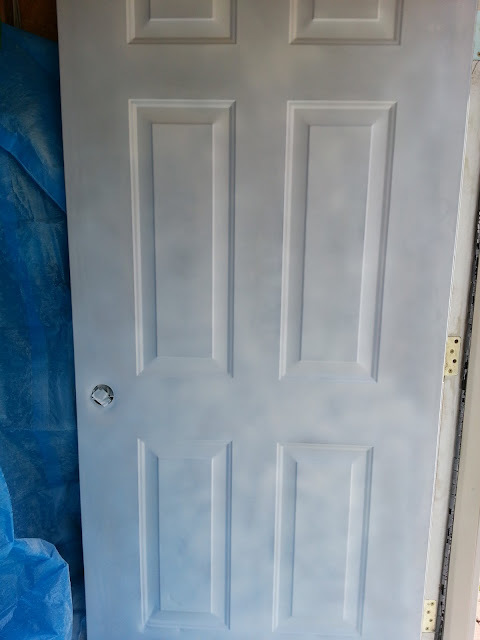 Once I had my two grits, I headed over to the spray paint aisle and picked out my primer and door color. 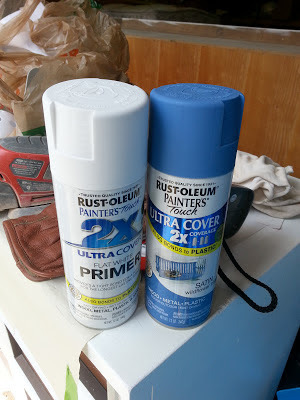 I wanted bright and pretty and have been looking at blue cushions for my patio furniture, so I decided on a gorgeous blue by Rustoleum. The primer was a flat white and offered fantastic protection against the elements. I did not remove the door from the hinges for this project. I'd like to say that my reasoning here is because I trusted my instincts and figured I would be able to accurately complete the project without bothering to take the door down. This is not really true. The door is way too heavy for me to get down without seriously hurting myself and I have no patience to wait for Boyfriend to get home to assist me with projects. 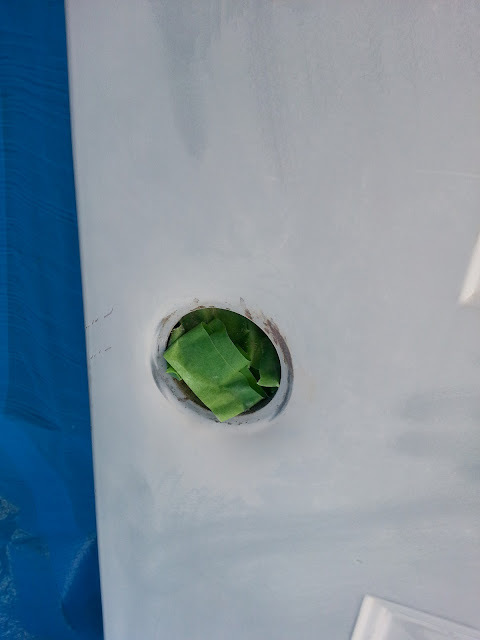 SO instead, I purchased some tarp from the hardware store and strategically placed it under and around my door, using painters' tape, and hoped for the best. In terms of other preparations for this project, I removed the door handle using a screwdriver. That's pretty much it. I was ready to sand. Because of the heavy rust, I made sure to wear a face mask while sanding, as well as protective eye goggles. Things can go flying and we don't want our faces unprotected, am I right? I used the rougher grit first, which was an 80 grit. 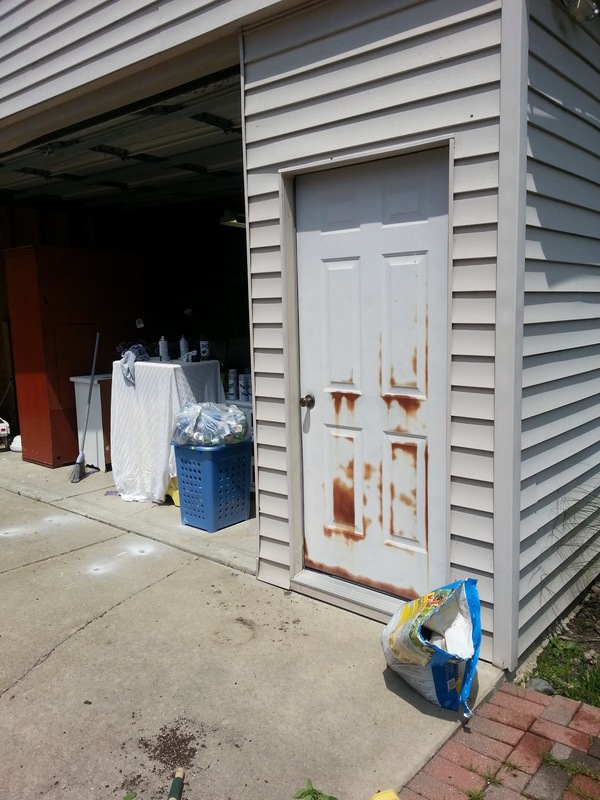 What we're looking for here, is to remove any loose, rusty material so that we have an even surface to work with. Once my surface seemed even all over, I then used the finer grit, 120 grit, to achieve a smooth and even finish. This is what the door looked like after I was finished sanding. Here is the door handle opening. I simply stuffed the opening with painter's tape to prevent any spray paint from getting inside. 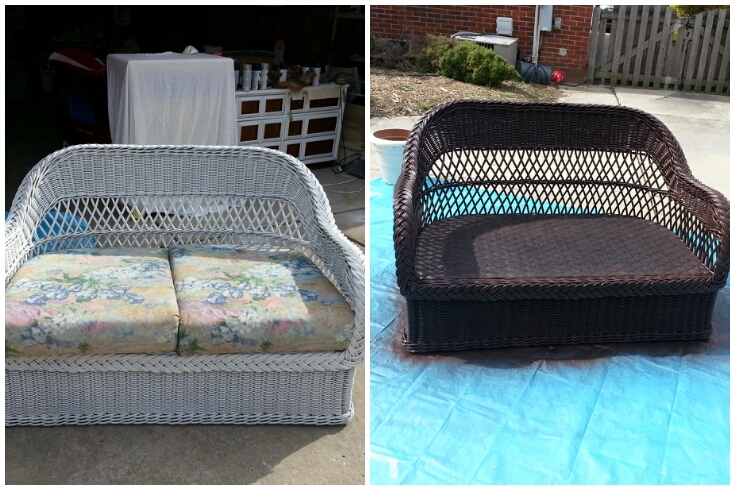 Notice the difference just one coat of primer can make! Once the primer was completely dry, I was ready to paint. I purchased 4 cans of my chosen color, just to be safe because I did not want to run out of paint mid-project. I ended up using just 2 of the cans. 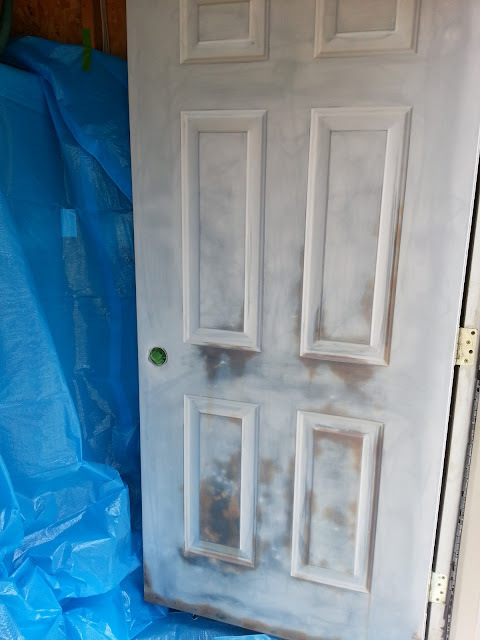 I wanted a professional look for the door, so I followed the pattern, spraying vertically around the panels and following the general shape of the panels. Again, swift and steady strokes are required as well as making sure you are the perfect distance away from the subject while spraying. This can be achieved by allowing yourself time to stop in between coats and look for obvious spray marks. Step away from the object as it dries, look at it from all angles. If you can see spray marks, you know to adjust the space between yourself and the object as you paint. This takes a small amount of practice and sometimes it helps to spray a piece of cardboard first, in order to hone your technique. I let the door completely dry between coats as well. This makes for a smooth finish without drip marks. 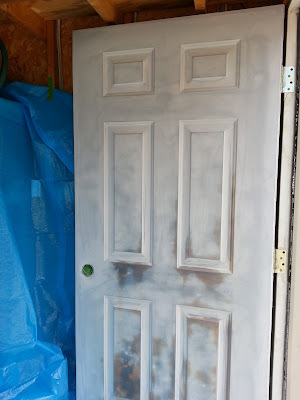 The door handles themselves were pretty beat up and tired looking, so I sanded those lightly and used a dark brown espresso spray paint I had left over from another patio project that would tie in nicely. You can see below I used small pieces of painter's tape in the keyholes to prevent paint clogs. Super simple and effective! Once everything was completely dry, I put the door knobs back on the door using a screwdriver. I loved the way the door looked but couldn't help but want for more color to brighten the overall facade of the garage. My local garden store was having a sale on hanging flower pots, so I picked up some gorgeous, purple petunias and made sure to grab two brackets to hang them on. I used a power drill to hang the brackets at each end of the garage and made sure to hang them at a height that would be easy for me to reach while watering on a daily basis. I had a leftover doormat from the dollar store which fit nicely in front of the door. I was satisfied with the completed look.